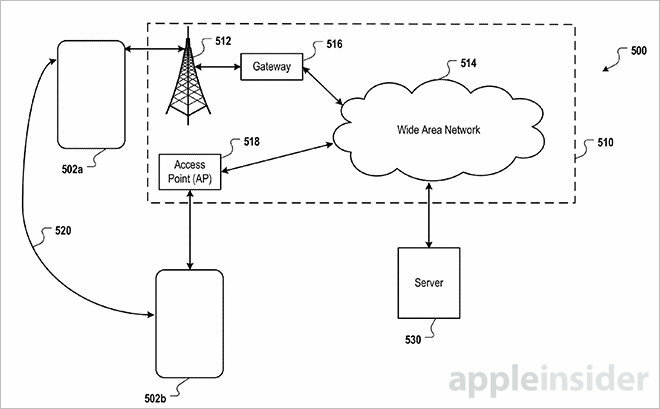 According to an Apple invention published Thursday, the company is looking into forms of data sharing that would allow an iPhone owner having connectivity issues to offload files normally stored in the cloud to a "friendly device" for later retrieval. 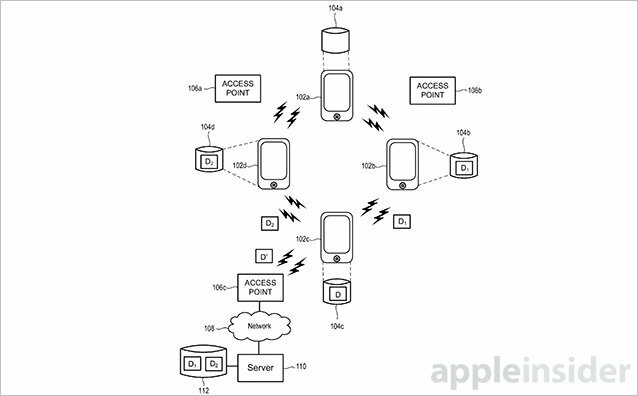 As published by the U.S. Patent and Trademark Office, Apple's patent application for "Secure ad hoc data backup to nearby friend devices" describes a method by which an iPhone or iPad user can easily create a peer-to-peer connection with a friend's device and transfer over file for safekeeping. The feature would be useful in instances when a user is collecting photos, notes or other data usually handled by iCloud, but can't upload due to network connectivity problems. In practice, a first device seeks out friendly devices in the surrounding area using Wi-Fi, Bluetooth, NFC or other short-range communication protocols. The request for backup can be initiated by the user, perhaps through an AirDrop option, while cross-referencing known devices takes place in the background with user information pulled from an app like Contacts. Along with a request to make an ad hoc connection, the signal also carries information that helps determine whether or not other devices are capable of accepting a backup file. For example, a target device would need the appropriate storage space, battery life and communications suite to handle the file transfer. Like AirDrop, the receiving device would display a notification for an incoming file, offering the user options to accept or deny. In some embodiments a friendly device can be set up to automatically accept incoming backup files from known devices. Before transmitting the backup, the first device encrypts packaged data with a unique key to thwart decryption by a friendly device or other nefarious users. Further protecting user data is an expiration date for retrieval. For example, a user may have one week to download the backup before it is erased. Alternatively, the data's owner can remotely trigger a data wipe much like a similar feature in Apple's Find My iPhone app. Once the data is safely stored, a friendly device notifies the connected cloud service that it is carrying a backup file for another user. In some implementations the data is transferred over to the cloud, where it waits until its owner requests a download. Other examples automatically push out backup data when it is determined that a device is reconnected with the network. It is unclear if Apple intends to include the system described above as a marketable feature in iOS, but data privacy practices are an obvious hurdle to implementing such tech. Apple's patent application for encrypted backup storage with friends via AirDrop was first filed for in February 2014 and credits Anil K. Kandangath and Xiaoyuan Tu as its inventors.